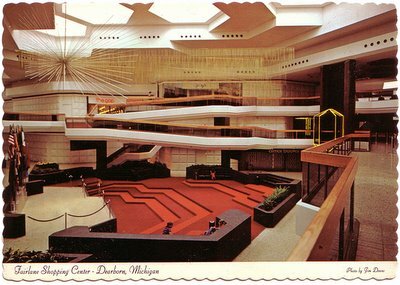 Dearborn, Michigan - Early '80s? This postcard just arrived today and I'm getting it posted right up. Just a stunning interior shot! There's no date on it, so I'm taking a (semi) educated guess and saying it dates probably to somewhere around the early '80s or so, give or take. I've done a blow-up detail, too, of that sweet light fixture ornament (I think I can make out tiny bulbs at the ends of the starburst rods. There's a Gap store visible here, too, on the upper level (not there anymore). 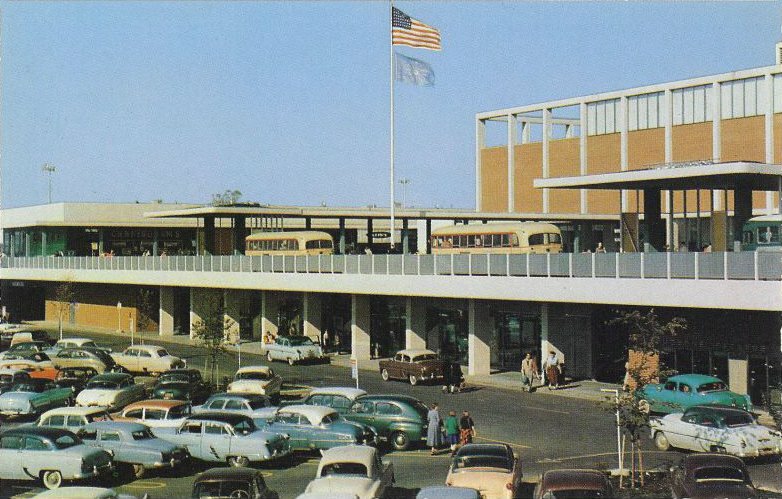 Back of PC reads: "This two-million square foot shopping center connected to the Hyatt Regency Dearborn by a 91-second monorail offers hotel guests indoor shopping in 180 different shops and restaurants." Fairlane's current website is right here. 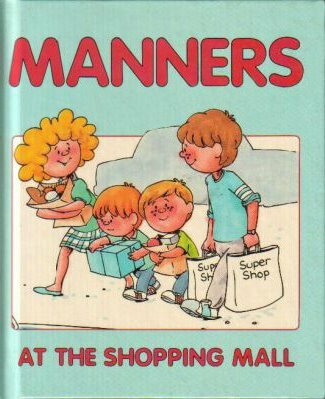 "The author takes the reader on a tour of the Mall of America, Disney World, and the suburban home and shows how each of these places communicate a whole world of desire." 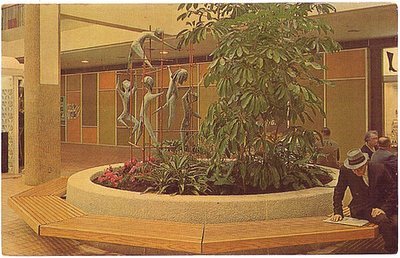 Midtown Plaza sculpture and foliage in this picturesque Victor Gruen-designed marvel. This shot is a beauty. Oh-so-'60s, yet oh-so-happening (dig those wonderful decorative wall panels back there)! 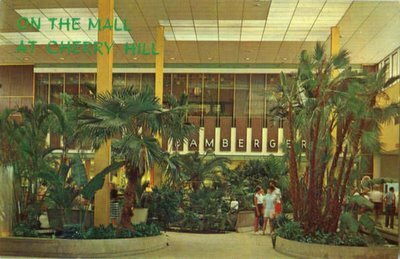 Yeah, I'm with that guy--looks like a nice place to read and relax (if you can tune out all the mall noise that is). Here's Midtown's current website. 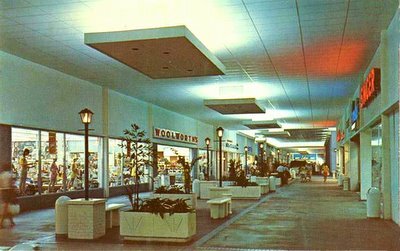 Loverly old shot of the Edison Mall, bathed in that wonderful incandescent and neon glow of a shopping mall! Looks pretty inviting to me. For anyone out there who missed it the first time I mentioned this (probably most of you), here's the clip of Malls of America being featured as a "Gem of the Internet" on the popular Attack of the Show program on G4 TV last summer, soon after my launch of it. Thought you guys might dig seeing it. 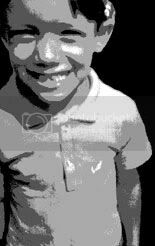 Note: The above video is in FLASH format, so make sure you have that enabled to see it. People have been requesting that I do something like this for a while now, so I'm finally getting around to it. Here's the first offering, with many more to come. Hope these picks prove interesting or useful to someone out there. 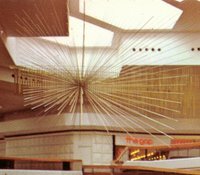 "An insightful account...Gruen believed that the self-contained mall would become 'the center of cultural activities and recreation.'" 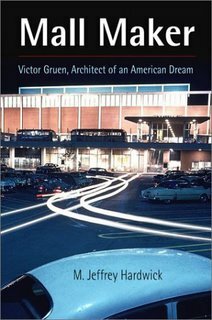 "Victor Gruen may well have been the most influential architect of the twentieth century. 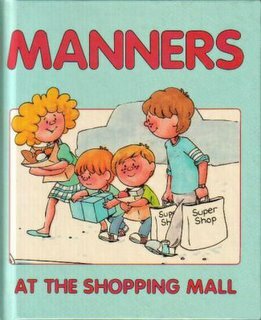 He invented the mall." "A great read and remarkable that no one has written about Gruen before now. if American retail and architecture is your thing, this is a must have. Hardwick captures Gruen in an objective light, in his time, for the reader to judge." 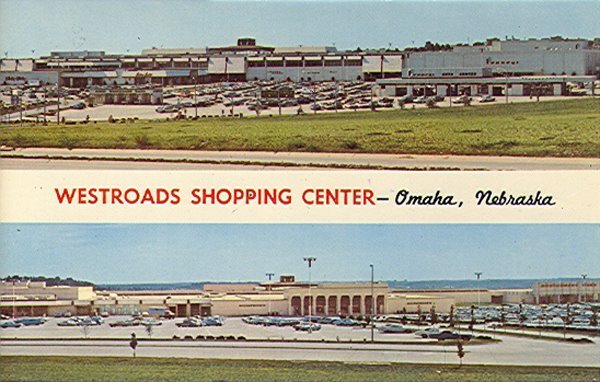 "My first true mall shopping was done in a Gruen mall, although I was quite unaware at the time, of the fascinating story behind this complex man and his vision for America's public spaces. Thanks to this engaging work by Hardwick, I now feel enlightened as I prowl the mall that Gruen built. 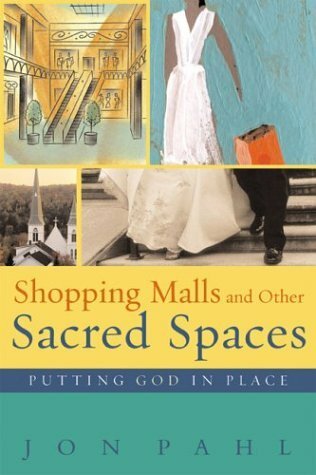 You don't need to be an architect or a social scientist to enjoy this book because the author makes the subject approachable for the inner shopper in everyone." 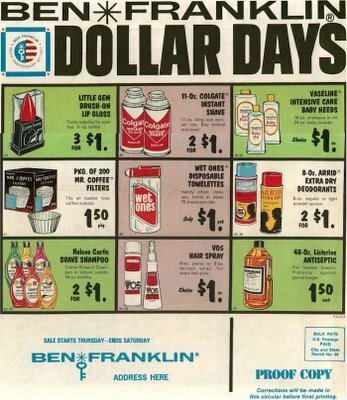 There's been some discussion in the comments here about Bamberger's stores. 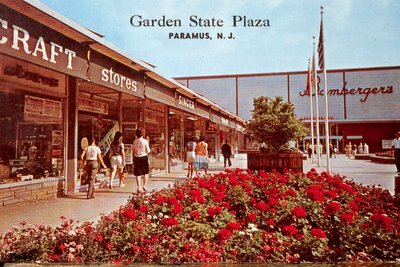 Well here's another one, in the Cherry Hill Mall. Can't really see much of it (for the trees), but it is back there. Nice exterior shots of Chris-Town Mall in its sun-washed glory days! 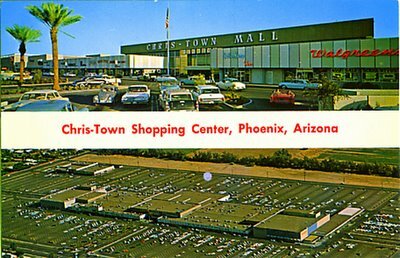 There's a ubiquitous Walgreens on the right in the top photo, and it looks like a shoe store to its left, I think. 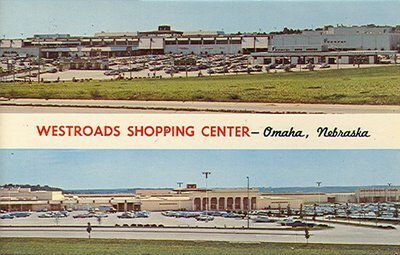 Omaha, Nebraska - Late '50s - early '60s? 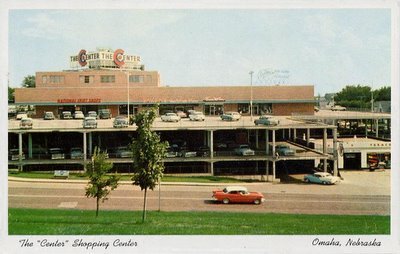 Similar to the cool Northland shot I recently posted, here's one in Nebraska with more multi-tiered rooftop parking grooviness going on. As for stores, I can make out a "National Shirt Shops" store on top to the left, and to the right of it, a Thom McCann Shoes, it appears. 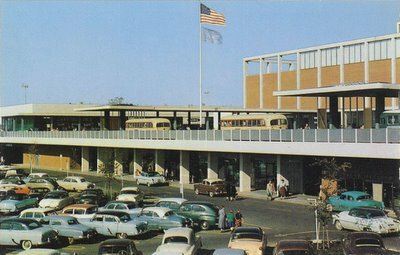 There's an attached Texaco station in the lower right corner. 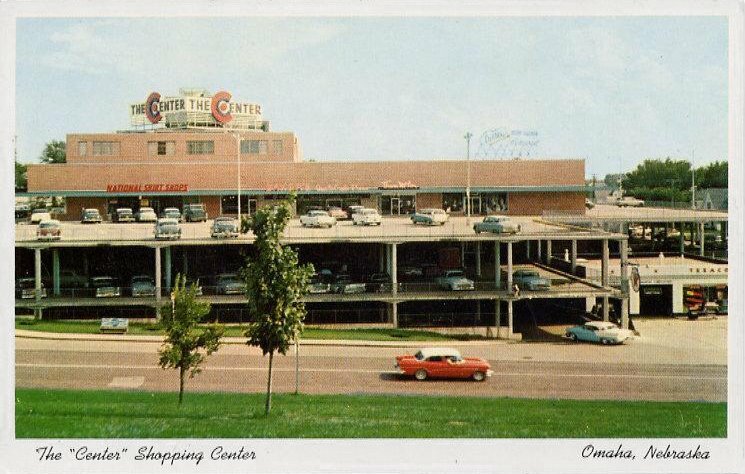 Anyone know if "The Center" is still there in Omaha? Didn't find it with a quick cursory check. Not sure that was even its actual official name, either, or just a local nickname for it. If it is still there today, I wouldn't be surprised to find the name changed by now. Thanks a bunch to, William Berry, in New Jersey, for this beautiful and very colorful submission! The old opening from Walt Disney's Wonderful World of Color comes to mind when I look at this photo! Remember the theme song? "The world is a wonderland of color...". 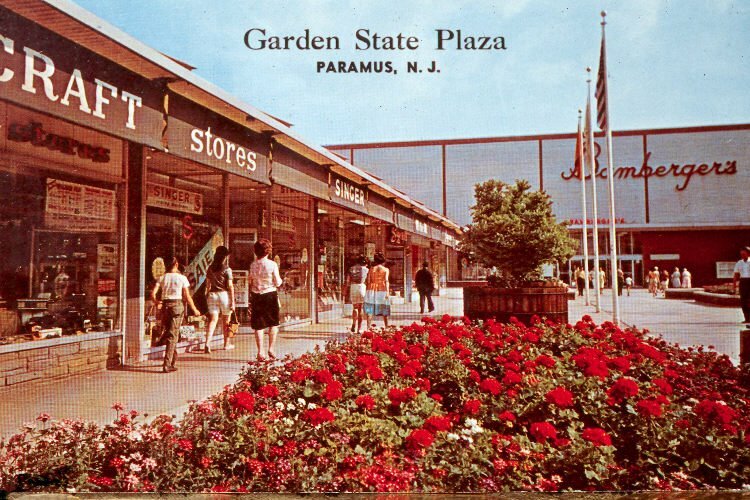 Anyway, Garden State Plaza's current Simon-owned website is right here. 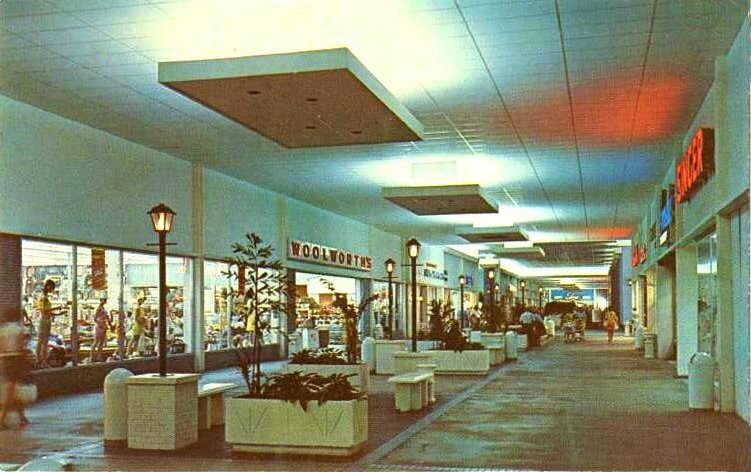 Now called, Westroads Mall, their current website is right here.